GeoTerra® Padloc System | GeoCHEM Inc.
Strong mats made from Recycled polyethylene. 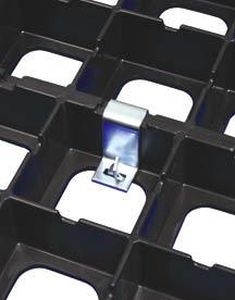 Mat sections are "locked" together with Padloc® connection devices. Great for transporting preassembled mats into sites. Crimps the Earth Anchor Ferrule on the cable. 6 PadLocs Required per GeoTerra ® Unit. 1000 lb. pull out/30 in rod - 20/box, Manual and w/ Hilti TE1000. Ratchet, 1 1/8"socket, 1/2" adaptor. Earth Anchor 1600-36 10C Foot - 50 per box. 1600 lb. pull out/36 in cable plastic washer. 2 packs of 25. Earth Anchor 800-29 5C Foot - 50 per box. 800 lb. pull out / 29 in cable metal washer. Manual and w/ Hilti TE1000.